"Uh, I used up all the storage in my iPhone 6s taking pictures of our honeymoon and need to save these pictures to my Mac. However, I have no idea on how to do that. Somebody help?" iPhone's excellent camera is one of the things that lure us to purchase it. It has good resolution and is being enhanced in every iPhone generation. With that in mind one can use his or her iPhone to take beautiful moments in life. As a way of doing a backup of these photos, you may want to transfer pictures from iPhone to Mac. But how to do it? This article will show you various ways on how you can transfer iPhone photos to your Mac without hassle. You may also need to know how to transfer pictures from iPhone to PC or how to free up space on iPhone. Way 7. Only Several Pictures to Transfer? Email to Yourself! 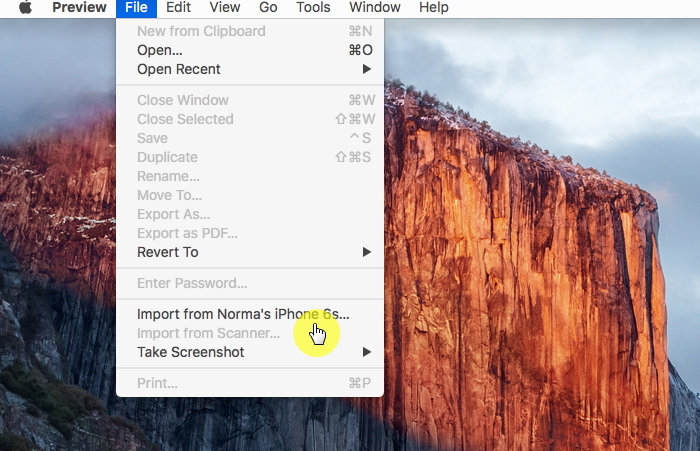 This could be the easiest and most direct way to transfer the photos you take by iPhone camera to Mac. What you need is only your iPhone and an USB cable. Step 1. Connect the iPhone to your Mac with a USB cable. You might be asked to trust the computer. If so, just trust the connection. Step 2. Once your iPhone is detected, the Photos app will open automatically. For OS before OS X Yosemite 10.10.3, it is iPhoto. If Photos app doesn’t open, just open it and then click on "Import" button at the top right. Step 3. Select all the desired pictures and click on "Import Selected" to transfer the pictures to your Mac. If you want to import all new photos on your iPhone, just click Import All New Photos. You can also use another built-in app on Mac to transfer your pictures from iPhone to Mac - iMage Capture. Even though the app was designed for other uses, but it works just like the Photos app regarding transfer pictures. Step 1. Launch Image Capture on your Mac. Step 2. Connect your iPhone to Mac using a USB cable and trust the connection. Step 3. You'll see a list of iPhone photos with specific details. Select the ones you need to Import, or import all photos by click Import All. Apple does offer lots of good apps which you can transfer pictures from iPhone to Mac and Preview is also a good choice. Same with Image Capture, if can transfer pictures from your iPhone just like from an external disk. Step 1. Connect your iPhone to your Mac and run Preview app. Step 2. Go to File > Import from [your device name] and then you will see the list of photos on your iPhone. Step 3. Choose the pictures you want to transfer and then click on Import to finish. Or, just click Import All to transfer all the pictures. 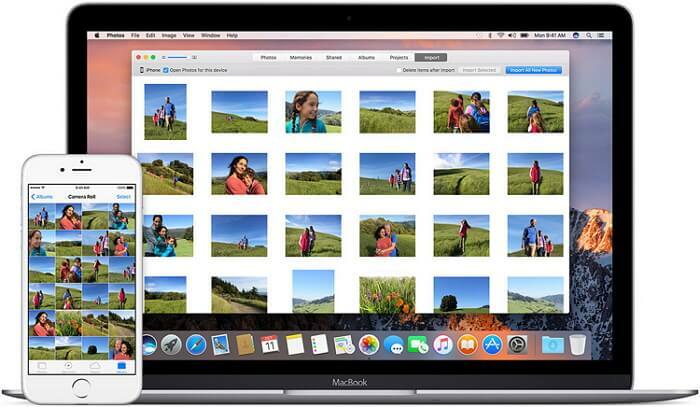 Apple gives you the convenience to access your photos across all devices if you turn on iCloud Photo Library on both of your iPhone and Mac. 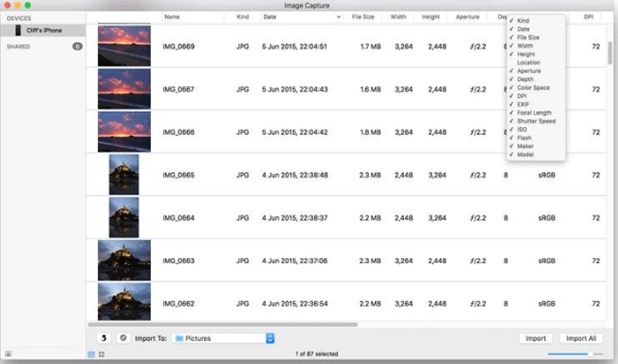 See how to access your iPhone photos on Mac by it. Step 1. If you use iOS 10.3 and later, just go to Settings > [your name] > iCloud > Photos, then turn on iCloud Photo Library. If you use iOS version before 10.3, then go to Settings > iCloud > Photos and turn on it. Step 2. 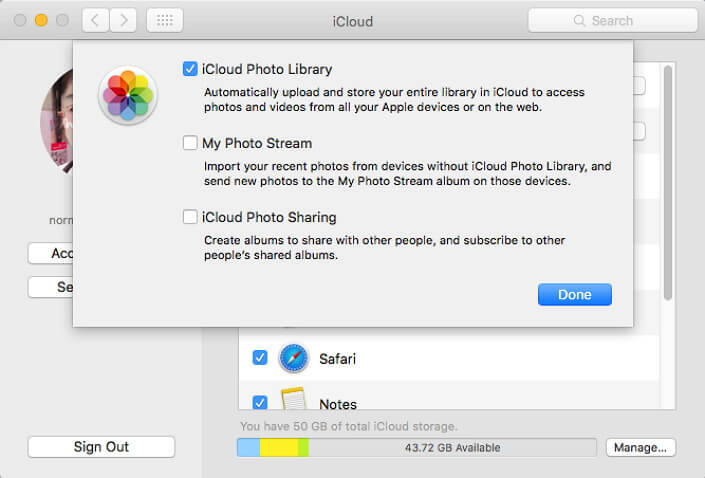 Next is to turn on iCloud Photo Library on Mac: go to System Preferences > iCloud. Click Options next to Photos, then select iCloud Photo Library. Step 3. Open Photos app on Mac and then you will see your iPhone photos. This method works for not only iPhone and Mac, actually you can access the photos on all of your iOS devices by it. 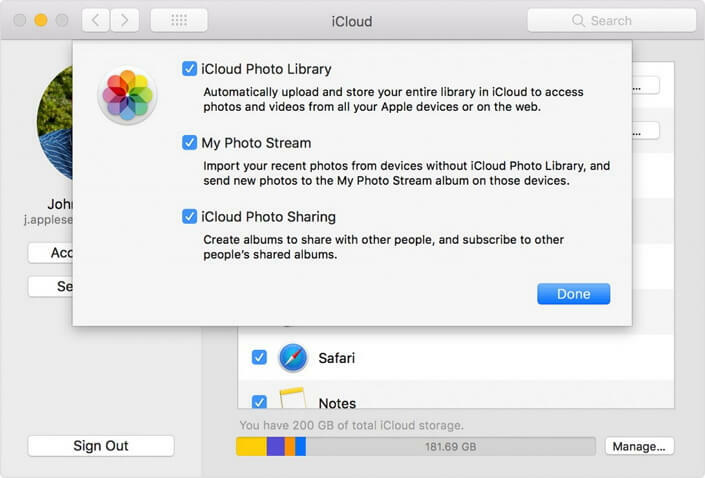 But we also know that Apple offers only 5GB free space for iCloud, but 5GB for all the photos? I believe that’s not enough for most iPhone users. Then how to do? You can try the next method. If you wouldn't like to buy iCloud storage for iCloud Photo Library, then iCloud My Photo Stream will be an alternative service. It will upload your pictures on iPhone to all your devices using same iCloud account, provided that Wi-Fi network can be used. The steps are pretty similar with turning on iCloud Photo Library, but what you choose on iPhone should be My Photo Stream and then you can see your iPhone picture on Mac. But you should note that the photos uploaded by My Photo Stream will only appear on your other Mac for 30 days, and only 1000 photos can be seen. 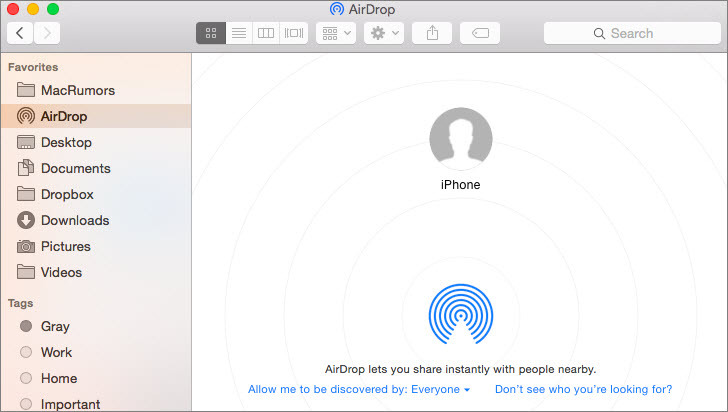 AirDrop allows you to transfer files between iOS devices and Mac OS devices over your local network if your Mac runs OS X Yosemite and later, and iPhone runs iOS 8 and later. It can transfer pictures easily by the following steps. Step 1. Connect your iPhone and Mac to same Wi-Fi network and turn on Bluetooth on both of them. Turn on AirDrop from Finder on the Mac. Step 2. 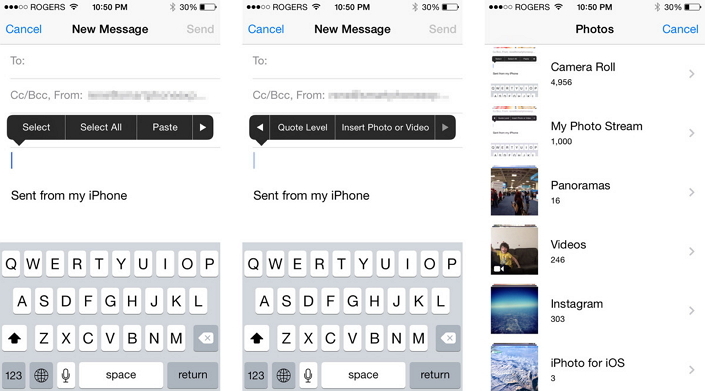 Open Photos on your iPhone and select the photos you want to transfer. Then tap on the Upload icon on the bottom left corner. Step 3. Tap the name of your Mac to instantly share the pictures selected. 7. Only Several Pictures to Transfer? Email to Yourself! If you only need to transfer one or two pictures and you don’t have USB cable on hand? You can email the pictures to your email address. Actually you can download the pictures to not only your Mac, you can even use them on your Windows computer. Step 1. Open the Mail app on iPhone to start a new email. Double-tap in the body to insert the pictures you want to transfer. Step 2. Send them to your own email address. Step 3. You can download the pictures by log in your email on your Mac when you need. Supports to transfer 18+ types of files to computer. You can transfer iPhone videos, contacts, and notes to computer. It supports all iPhone, iPad and iPod touch, including iPhone X and iPhone 8 running iOS 11/10/9/8. It allows you to not only transfer data from iPhone, but extract data from your iTunes or iCloud without any hassles. It is straight-forward and time-saving to use. Open the iMyFone D-Port and using an USB cable to connect your iPhone to Mac. Select "Back Up & Export from Device" and click the "Export Data" button. Select the file you want to transfer to Mac. Here we choose "Photo". Click "Next" to continue to scan. Step 3: Preview and Transfer Pictures. 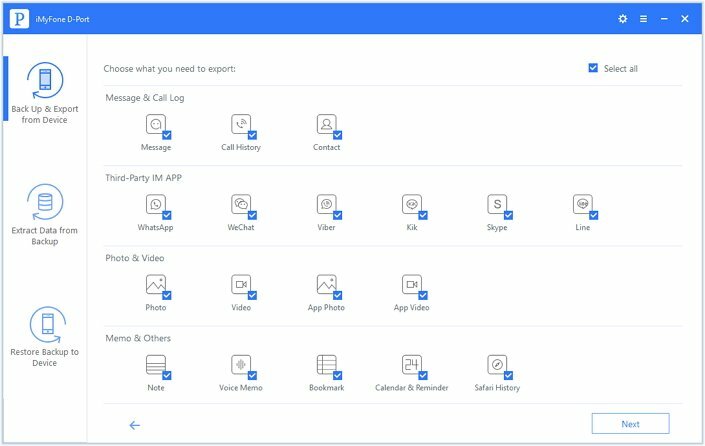 Preview and choose the ones you want to transfer. Then click the "Export" button on the lower right corner of the program and iMyFone D-Port will prompt you to select one place on Mac to store your pictures. We can offer more than one way to transfer iPhone photos to Mac and you can choose the most suitable for yourself. 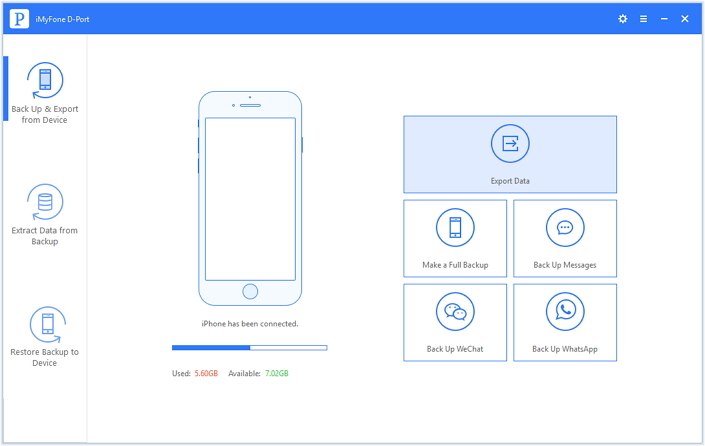 If you want to transfer more files from iPhone to computer, no matter it is a Windows or Mac computer, then iMyFone D-Port is the easiest and best way. 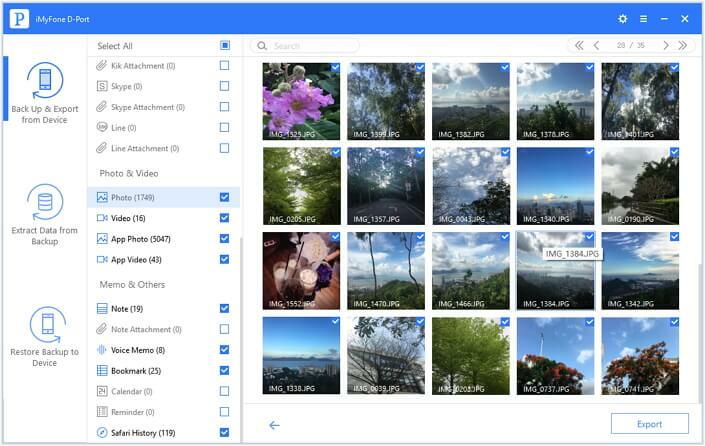 This tool allows you to select the specific pictures to transfer and preview them before transferring them. Download it today on your Mac OS X 10.7.5 ~ 10.11 and enjoy easy transferring of videos, images, contacts and other files. How to Switch iPhones at Home?